Larry Killip is an independent music producer/songwriter/artist residing in New Zealand. Larry writes melodic eclectic pop/rock that tends to accentuate the positive. He has an extensive music background having played live in many many bands, from the late 60's through to the present day. In particular his band "Larry and the Ladders" had several single releases in the 80's as well as numerous television and radio appearances. Forever young, Larry Killip continues to produce his own albums, first "Wild Sky" 1996 now "Good To Getaway" just completed and now available at CDBaby.com. We have spring downunder, we had a really wet and moderatly cold winter, spring is a welcome relief for us in New Zealand. I have uploaded a new song, "To my Grandchildren's grandchildren", with the technology we have today future generations will be able to know everything about us....read our blogs, see our images, hear our music, in fact this very entry may be cached and read 200 years from now..if so...Gidday!!! The sun beats down and we reel in the heat one week before a downunder Christmas. It's summer again in New Zealand and weather wise it looks like it's going to be a good one. There's change and uncertainty in the air for sure and the money changers palms are sweating...but I will be performing and playing my guitar tonight so for few hours anyway none of it will matter. After many hours writing and recording my new album "Never Going Back" is done. 26th October I shall be celebrating this release by performing songs live from the album in Auckland New Zealand, ok, a bit far away from most of you, we call it the "tyranny of distance!". Price I pay for living in Middle Earth. Some tracks already listed here, meantime checkout www.larrykillip.com for more info. New page for "Never Going Back" any day now. Just uploaded one of the new songs off my new unreleased album, "Never Going Back". the song is "First Time". I used a pumping synth bass line under a standard rock track with drums & guitars with lyrics focused on those "First time" experiences...like a sun ray, after the rain... like a good day when you've been going insane...a first kiss by the wishing well....all those and more. To be honest I struggled with this song, it wasn't easy, especially the bridge, which I finally resolved by simply adding lots of echo to set it apart. I hope you agree it works, it certainly works better than what I had before that. When you do your own songs it's a funny thing. The songs you think are naff, you often find your best friend likes...and the one you like...well, you just can't tell. So the moral of the story is..do it anyway. But you knew that. Somewhere along the way you have to step out if your offering something creative to the world. There comes a point where you say..."Here it is!" Yup, gettin cold down here in litlle ol' New Zealand, never snows in Auckland but she's a bit brisky out. further down south middle earth is buried in the white stuff. I have just uploaded three songs from my back catalogue, two from my first album "Wild Sky" and another song "You're The One" that I wrote and recorded just a few days before a TV performance I was suddenly called in for where I performed it. "Johnny Is A Runner", pop/rock track dedicated to the many "runners" that did their training on the streets of auckland throught the 1960's and 1970's. Some, like John Walker went on to become heroes in the mile/1500 metre. Many thanks if you listen. 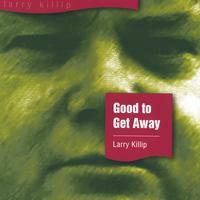 Good to Get Away" is an adult rock "must have" CD by Larry Killip. This is a masterful work that shows the professional quality work that can be done without a big-label contract. The tracks on this CD reflect Larry's excellent songwriting ability - very melodic songs with unpredictable yet enjoyable chord progressions, effective builds to memorable choruses, and thoughtful and thought-provoking lyrics. Add to this, Larry's excellent musicianship and distinctive voice, along with some tasteful sax fills and you have a masterful work. The recording quality and production are excellent as well. The music is reminiscent of The Beatles and especially Paul McCartney. The title track is a very memorable and thought-provoking song with a catchy guitar melody and keyboard countermelody in the verses that leads to a well-resolved chorus. "Beautiful Song" is very appropriately titled, and will stick in your head throughout the day, showing the power of the melodic and memorable chorus. Similar comments for "In Blue Daze." We can go on and on raving about this CD. If you enjoy adult rock or simply want to hear a masterful songwriter and very talented performer at work, you will enjoy this CD. Pick up a copy today! You have been awarded our top honor - The Gold Artist Award - We plan to feature your outstanding songs on our RadioINDY Gold Artist Music Stream - Good Job!